It is estimated that around 1 in 3 office-based workers are suffering from early signs of repetitive strain injuries (RSI), which are caused by using computers for long periods of time. A report into RSI, conducted by the HSE in 2003/2004, estimated that around 4.7 million working days were lost in this period because of such conditions in the UK. Even then, with the amount of people who just try to work through their RSI related symptoms, and taking into consideration the number of cases that are not properly diagnosed by doctors, where people are just told to take an afternoon off with an ibuprofen, it is actually very hard to get a true idea of the extent of RSI related problems in this country. Some agencies even claim that we are sitting on the verge of an RSI epidemic, with years of bad working practices creating a massive strain on our working population. Many of these problems are associated with office work, and can be easily prevented by looking at the way we use office equipment, such as the way one sits at a desk or the positioning of one's chair. There is no one condition that defines RSI, rather there are a number of conditions that are all caused by repetitive types of motion, which are covered by this group definition. These can range from sports injuries through to problems such as the well known Smart-Phone thumb. In recent years, there has been more attention focussed by the health profession on upper body RSI that are associated with office jobs, and in particular keyboard usage. We have provided you with a short list featuring two of the most commonly occurring problems that are likely to be faced by employees in such environments. 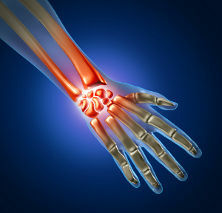 The carpal tunnel is a special part of the wrist that supports the nerve structures that control your hands. Long periods of typing, or any other kind of repetitive movement that involves the wrist, can create a pressure on the median nerve, which over time may cause pain, numbness, tingling and other problems within the hands. However, there are a number of factors that are associated with this syndrome, including obesity and arthritis, that can contribute to the symptoms and onset of this RSI. 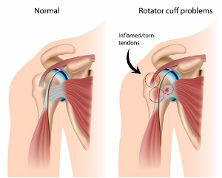 Also known as tendonitis, this is the inflammation of a tendon within the body, most commonly in the arm or shoulder. It is caused by repetitive motion, particularly one that places undue stress on one part of the body through stretching, so you'll find that this is also often a common complaint of athletes, such as rock-climbers and swimmers, as well as office workers. Symptoms range from a small ache or pain in the joint, through to a burning sensation round the entire joint, and in a worse case scenario there may be a complete lack of movement and stiffness in the affected body part following a period of rest. It is also believed that stress may be a factor in bringing on these symptoms. Although we're not doctors, we have been able to collate a large amount of information from government help sites and medical advice documents, which list some ways in which RSI can be avoided. Ultimately there is no preventative measure better than working in a methodical manner, where you take structured breaks away from desk bound activities. We can all be guilty of working too hard or trying to do too much in too short a time, and in the long run a slow and steady pace will always stand you in good stead throughout your working career. You'll want a chair that supports your lower back effectively, thus reducing the amount of strain on your entire back. A good chair will have a back that is upright, and will allow you to adjust its height, so that you can sit with your knees level to your hips. If you have short legs, then you may need a footrest to achieve this, which is essential if you're planning to do long four hour shifts on the phone or at a PC. Ordinary office chairs work best, with short arms that allow you to slide under the desk, helping you find the ideal posture for your keyboard. Casters are also good, as they grant movement around the desk space, reducing the amount of times you may need to stretch out of your chair to reach a vital object. Arm-rests are also essential, providing support for your arms whilst you are not typing or on the phone. However, try to avoid executive chairs with deep backs and tilting mechanisms, as these rarely provide you with effective lumbar support. Getting the right chair is one of the most important points of a successful anti-RSI strategy, and your workplace is obliged to provide you with a chair that is comfortable, and will not give you RSI related problems. Although getting the right chair is incredibly important, it is also vital to make sure that you have the correct posture when addressing the desk. You'll want to have your keyboard positioned so that it is parallel with the leading edge of the chair, allowing you to keep your shoulders straight whilst typing, and your wrists and arms level with the keyboard. The mouse should be as close to the keyboard as possible, so that you don't have to reach out or stretch to use this vital peripheral, allowing you to access it with flat, level wrists. Your monitor should be square on to the keyboard, preventing undue strain on your neck from turning or twisting your head to face it. All of your desk accessories, such as staplers, calculators, notepads and pens, should also be arranged to be within an easy grasping distance. The key here really is to keep an organised and tidy desk, so that you're never fumbling around for equipment, or having to move into stress positions to reach for different office tools. You may have a tendency to cradle your phone handset on long calls between your shoulder and neck. This can be a real problem if you work in fast-paced sales offices where you need to ascertain and qualify large amounts of information from clients during calls, and thus have to keep your hands free to make notes. Cradling is one of the most dangerous strains you can put on your body, and will quickly cause problems in the back and the neck. If putting calls on speaker-phone is not an option, and in many loud and busy environments it's a real no-go, then your workplace should be able to provide you with a microphone and earpiece style headset, which allows you to talk on the phone, whilst keeping your hands free to perform other tasks. This is the safest way to use a phone for long amounts of time during the day. As you're probably realising, one of the leading causes of RSI is typing for long periods of time. Many people have never been taught how to type correctly, and thus use a two finger method that can be very stressful on the hands. Therefore by cutting down on the amount of typing that's required in a job, one can also reduce the chances of RSI related complaints. Many smart-phones have voice-recording software that can be used in place of typed notes on a computer, and if you've got a very modern office, or if you work on your own, then you may want to consider one of the many voice typing systems that are available – there's even one built into some versions of the Microsoft OS. There was a time when typing was a GCSE subject taught in schools. Good keyboard work was essential, as workers were writing straight onto paper, with no recourse to a delete button, which meant that typing had to be right, first time, every time. There is a well respected method of spreading your fingers across the whole keyboard and using the entire hand range to type, known as touch typing. However, even though the keyboard has become one of the key communication tools of our modern-age with email and social networking now playing an important part in all service and office run businesses, it seems we have forgotten the real skill of typing. By learning the correct way to touch type, you can cut down on the amount of stress incurred by performing this vital activity. There are now a number of programs and websites that can help you learn touch typing, with many providing a free service. Another way of reducing the amount of strain placed on your hands is to avoid contorting, which isn't covered in touch typing courses. Contorting is where you use one hand to press down on two keys at once – for instance when cutting and pasting between documents. Try using two hands to press the two operational keys simultaneously, as this will reduce the stress on your hands considerably. Even though your hands should be flat and level with your keyboard and mouse, it's still possible to encounter RSI-related symptoms over years of using this equipment, which can cause pain in your hands, wrists and shoulders. There are a number of things you can do to reduce the amount of stress associated with these peripherals. For instance, you can get special products for your wrists that support them whilst you use your keyboard and mouse. These are usually supplied as long strips of gel-filled plastic for the keyboard, giving you extra cushioned support on which to rest your wrists as you type. A similar device is available to support your wrist whilst using the mouse, which is comprised of a mouse mat with a large gel lump on it to support your wrist whilst using this interface device. Equally it's possible to buy specially created ergonomic keyboards that are split in two sections, which encourage touch typing and good hand positioning, as well as different types of mice that allow you to keep your wrist static whilst working. These include the old fashioned kind of track-ball mouse, which is great for office based work, but if you're a designer type who's using applications such as InDesign and PhotoShop, then you might want to use a tablet style interface that allows you to keep your dominant hand flat on the desk as if you're using a pen or pencil. In addition to ergonomically crafted keyboards and mice, you can also get hold of ergonomically shaped chairs and desks. However, although many of these look like nice and often very modern designs, it is important to also check that they also adhere to the points described in our chair and desk guides, ensuring they offer the right kind of support. There are many stretches that you can do in order to avoid RSI related conditions and symptoms – too many to list in just one article. As one of the most commonly occurring problems in office workers is carpal tunnel syndrome, here are some stretches that will help you avoid this condition as an example. First hold your arms out at shoulder height, and put your hands up so your palms are facing the wall in front of you for five seconds. Then ball your hand into a fist for five seconds, before rolling your fist towards you so you can see your knuckles for five seconds. When you have done this, shake out your hands and repeat, till you've completed ten sets of these stretching exercises. Over an eight hour day, you should try to repeat these exercises three times for maximum effectiveness. Even though the standard thinking in offices is that long breaks after long periods of work are an effective way of reducing the risks of developing RSI related symptoms, many experts now believe that a policy of short periods of work, followed by short breaks, are a much better way of preventing problems such as neck strain, back ache and carpal tunnel syndrome. It is suggested that the ideal way to work in an office is to use a computer and keyboard for around 50-60 minutes, before stopping for a 5-10 minute break. This is apparently more effective than stopping for a 15 minute break every two hours, even though this latter system seems to often be office policy for many desk-bound workers. It may be best to have a discussion with your employer about the best way to prevent RSI in the office. If you allow your symptoms to go untreated, then they may become constant, and you could never properly recover from them. Most of the time the doctor will prescribe rest and anti-inflammatory drugs such as ibuprofen or aspirin, or perhaps the use of products such as deep heat or a good old fashioned packet of frozen peas, depending on your symptoms. More often than not, they will also tell you that prevention in this area is much better than cure, and by adopting good working practices, such as those listed in this article, you can avoid the symptoms of RSI. Some people stand by alternative therapies as the best way to combat the symptoms of RSI. Many people who are long term sufferers of back-pain may have a favourite masseur who can work the knots and stress areas of their back, allowing them to return to work for long periods free from pain. Equally those who suffer from carpal tunnel syndrome or tenosynovitis often swear by acupuncture or herbal medicines. Perhaps one of the main ways in which these therapies can help is by creating a relaxed mind-space for the RSI sufferer, where they are able to de-stress and let go of the pressures of today's modern working environment. The medical profession is paying an increasing amount of attention to the manner in which people's mental conditions can affect their body's ailments, and it's now believed that many ailments, including RSI, can be treated by removing and alleviating head stresses. Even though some professions are more prone to RSI related problems than others, it is not legal for any employer to place a clause in a working contract that exempts them from responsibility towards the well-being of their employees in respect to such ailments. If you develop some symptoms of RSI whilst at work, in the first instance your employer should give you time off to allow you to recuperate, although it may be best to see a doctor to get a professional opinion on your health situation to verify any RSI related condition. In the worst case scenarios, your workplace should have a policy where they support you whilst you are off work for a set time period, which may be linked to the length of your employment with the company. However, if things get to a point where this support expires then you may need to register as sick with the doctor, and claim sickness benefits with the local and government authorities. If you do find that you have RSI, and you are not supported by your employer, then you may well have a good case for compensation. It can take a long time to recover from many conditions related to repetitive stress in the workplace, which may lead to loss of earnings, failure to keep up with mortgage payments and problems dealing with the modern financial burdens of family life. In these cases you may well be eligible for compensation. There are now a number of work-place solicitors who are able to offer packages where they will not charge you a legal fee, unless they secure compensation, and there are even operations that can guarantee you a 100% return of all the money claimed in such proceedings. Even when you have insurance against RSI related problems stemming from work, according to many RSI action groups and charities, there are often problems claiming what's owed from your insurance company as they will often try to assert that RSI conditions are non existent, or not causing you to suffer in the manner you're describing. In these situations lawyers can be indispensable, helping you get the money that's due to you in accordance with your policy.